Hello Guys, We are here for another movie Tum Bin romantic dialogues. This is a romantic love story movie which was released in 13 July 2001. This movie is directed by Anubhav Sinha & produced by Bhushan Kumar. Priyanshu Chatterjee, Himanshu Malik & Raqesh Vashisth played in main lead role. This is a very sweet and romantic love story. The movie has very sweet song and music. All songs are very romantic. The movie has so many beautiful and heart touching dialogues. 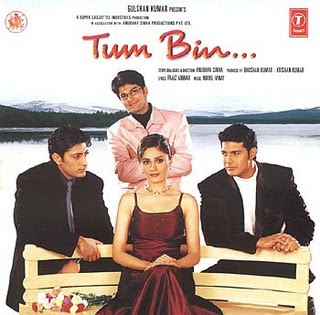 I have collected best dialogues of this movie Tum Bin. "Manzil par pahunchne ki khushi tabhi hoti hai jab ... humsafar sath ho"
"Yaad kuch yun rakhna ki tumhare jeene ke kaam aa sakun"
"Janta hun aapko sahare ki zaroorat nahi ... Main sirf saath dene aaya hun"
"Yeh emotions bhi kitne stupid hote hain na ... logic hi nahi samajhte"
"Hum aur zindagi umar bhar ek doosre se ladte rehte hai ... Aur anth mein jeetii maut hai"
"Bank account ke figure mein jitne sunya badhte jaate hai ... Zindagi ka sunya utna bada hota jaata hai"
अग आई ऐकना.. हा तुझा आशीर्वाद ना...सदैव माझ्या असाच पाठीशी असू दे आणि आता जी पण मला पटेल ना ती आयुष्यभर माझ्या सोबत असू दे..